The arts have always been an important part of Barbara Nordling’s life. Her father was a basso profundo who sang locally, and she sang in many church and school choirs growing up, as well as a barbershop quartet while living in Hugoton. Her first foray into the world of the creative arts at KU was as a member of the School of Fine Arts Advisory Board, on which she served for 24 years. After her husband died in 2005, Nordling continued their tradition of supporting various areas across KU, including a dance scholarship for KU students from western Kansas. 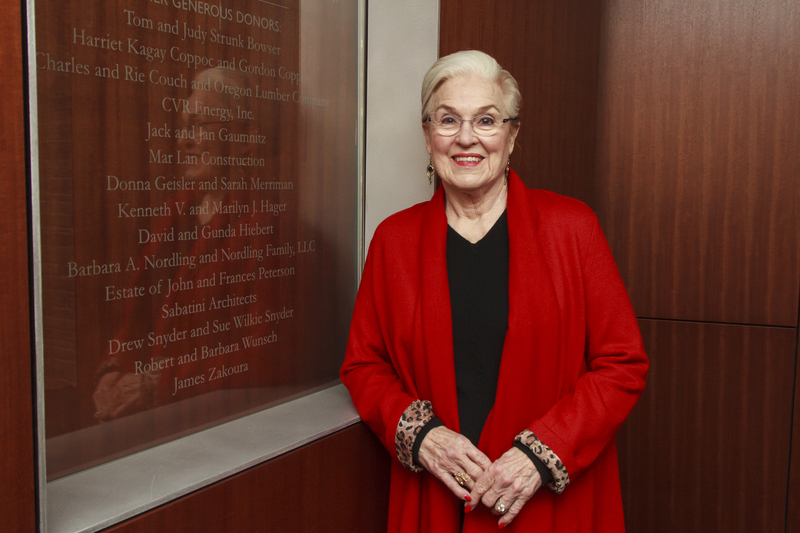 As Nordling’s admiration for the young dancers at KU grew, she recognized a need for special opportunities for young men who are aspiring dancers and created a scholarship specifically for them. This scholarship provides an opportunity not only for male dancers, but also for female dancers to gain experience in partnering. After all, “What is ballet without the wonderful men?,” Nordling said. Although Nordling’s generosity expands beyond the arts, she’s particularly fond of her arts scholars and the many opportunities she has to truly see them grow and perform.